At some point during her Hawaiian adventures, Ursula met a young man named Samuel B. Riddick. 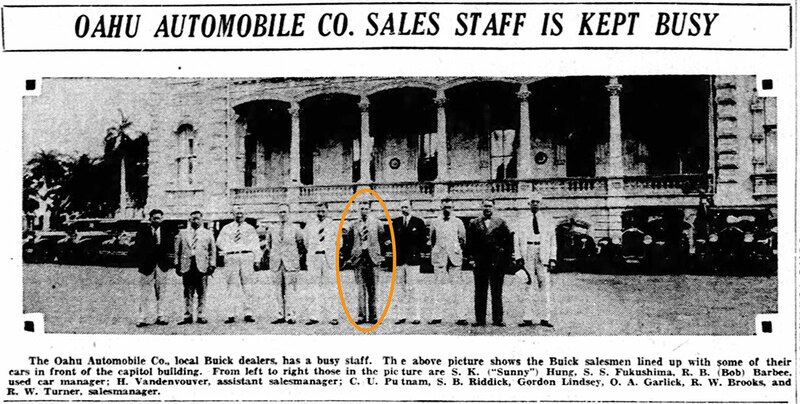 I don’t know how they met, but I like to think it was at the Buick car dealership, where he worked as a salesman. It’s possible that Ursula’s friend Elizabeth bought her Buick sedan or had it serviced there, and perhaps Ursula accompanied her, catching Samuel’s eye. Follow Mystery Dancer on Instagram! Was Ursula in the Movies? Anchors Aweigh: Here’s Wishing Ursula a Happy Voyage Home! Happy Holidays from Mystery Dancer! Copyright © 2019 Mystery Dancer All Rights Reserved.